As some of you may know, I am on vacation! Woo hoo! Fun times ahead with family and friends! I am having a blast, but I am sorry to say I was not 100% on plan. I know... BAD ME! I was only off plan the first two days of vacation, but now I am back OP. Even for those first two days of being a naughty girl, I did eat five Medifast meals daily and one regular meal. Now the other meal did not happen to meet Lean and Green meal standards. That is what got me into trouble! I hate to say it but I did gain one pound. Since being OP yesterday, I have already said good bye to that one pound and I am now the same weight as when I left for vacation! I consider that a victory because normally good eating habits and vacation for me just don't mix. I will keep you posted on how I do the rest of my vacation, so stay tuned! Grand total after subtracting my bets: $142.09! Go me! Go me! It's my birthday! Okay, it isn't my birthday, but it sure feels like it! For the month of August, I only signed up for the one I created Sandy's Kitchen August DietBet. I might sign up for more when I get back from vacation! I am officially addicted to Dietbet! Are you interested in trying the weight loss plan I am on? If so, check out some of these great deals below! Medifast has some deals for you! If you use my code, SANDY56, and sign up for Medifast Advantage when you order $250+, you’ll receive 56 free Medifast Meals and free shipping! You’ll receive 28 free meals with your first Medifast Advantage order and ANOTHER 28 free meals with your next order! This offer is only valid if you enroll in Medifast Advantage, and it’s limited to one per customer. It’s not valid with prior purchases, any other promotions or discounts, or for Medifast Ready-to-Drink Shakes. Not ready to enroll in Medifast Advantage? You can use code SANDY28 to receive 28 free meals with your purchase of over $250. Limit one per customer. This offer is limited to new customers only and not valid with prior purchases, Medifast Advantage, or any other promotions or discounts. Both codes expire on 12/31/13. See website for complete details on program and discounts. Consult your physician before beginning a weight-loss program. 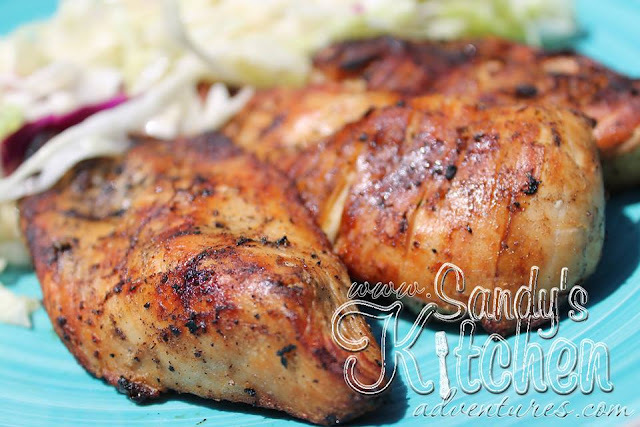 If you are looking for a different variation of grilled chicken, then this is a great summer recipe for you to try! WARNING! You must be a fan of root beer... I mean after all... it is called marinated grilled root beer chicken! The name says it all! I, for one, absolutely love the taste of root beer so I was pretty excited to try this recipe and so happy I did! Hubby on the other hand, wasn't too thrilled with the flavor, but he also doesn't really care for root beer. This is just one of those recipes that can be a hit or miss for the family. I will definitely make this again even if it is only for me :) and possibly experiment with coca cola or orange soda. Anything to try and keep plain old grilled chicken just a little bit more exciting! First, you need to pour the diet root beer in a medium sized bowl. Then add the apple cider vinegar and oil to the root beer. Next, pour in the lite soy sauce and give it a good stir. Place the chicken in the marinade and refrigerate for more than 3 hours. As you can see, there will be tons of marinade leftover so you will only be using half your condiments and healthy fats. Mmmmmm... marinated grilled root beer chicken! Bon appetit! Combine root beer, vinegar, oil and soy sauce in a large bowl. Add chicken and marinade at least 3 hours. I marinated overnight Grill. 3 servings with 1 Lean, 2.16 Condiments and 1 Healthy Fat per Serving (since the condiments and healthy fats are in the marinade, only half is absorbed and half is discarded).